Easynews has been a Usenet Service Provider since 1995. They offer both NNTP and Web-based services . They have some distinct features we found that set them apart from their competitors. Once such feature is their web-based browser. Which allows you to easily access newsgroup with any device that has a web-browser via the HTTP web server. Didn't use all of your bandwidth this month. They offer Roll-Over gigs. Which are any bytes you didn't use that month are rolled over to the next month. NNTP header compression, zip manager and mobile app are just a few more additional perks you will receive with an Easynews account. They are the original, web-based usenet provider offering the best newsgroups with the fastest speeds and service. 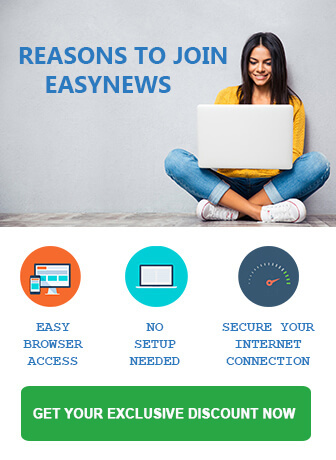 Easynews offers four different plans for their customers to choose from. Three plans offer block accounts. Classic Plan: Comes with 20GB/month and 1 GB of loyalty gigs. You can customize this plan with additional web retention or add unlimited NNTP. Plus Plan: Comes with double the amount of data usage per month as compared to the Classic Plan. The amount of loyalty gigs is also doubled at 2 GB. It offers the same customization addition that the Classic Plan does. Big Gig Plan: Offers the best value for money it has everything you need. This plan comes with 150 GB per month, 12 GB of loyalty gigs and unlimited NNTP. Unlimited NNTP Plan: You receive 60 connections, 3,406 day retention and 14 days of access to their Easynews Web. A free 14 day or 10 GB which ever comes first Usenet trial are offered to new customers of Easynews. This allows the users to test the unique web interface as well as the NNTP access before parting with their cash. The Unlimited NNTP Plan doesn’t offer a free trial. Easynews NNTP access is amazingly fast. The download speeds are mind blowing with the Easyboost web accelerator which greatly improves your performance. After all they have been in the business since 1995 so definitely know what it takes to provide a premium Usenet service. Easynews provides header compression on their NNTP news servers and newsgroups this allows the download speed be to up to a hundred times faster as compared to downloads without compression. Downloading of multi-part posts is simple thanks to the Easy Assembler feature. Let the Easy Assembler do all the work for you from your favourite web browser, it is as easy as click and save. Easynews rewards customer loyalty. They offer the Refer a Friend and Customer Loyalty rewards. Receive free months or Triple Gigs for every friend you refer and who becomes a Easynews customer. You can earn Loyalty Gigs just for having an account, receive additional gigs every year on your Easynews account anniversary date. They have a web page specially dedicated for customer support. You can find FAQs, news and other general information there. You can also get support through email, phone, live chat support and message board. They even have Easynews 101 and other added feature video tutorials. They have thought of everything. Easynews has done a tremendous job of creating a Premium Usenet Service. Whether you are an expert or a beginner, if newsgroups is something that you use every day or not as often Easynews has made it easy and affordable. Choose your Easynews Plan and get started today they guarantee you won't be disappointed.